First daughter and White House senior adviser Ivanka Trump is shutting down her eponymous fashion company. The brand’s remaining products will continue to be sold at stores like Lord & Taylor, Dillard’s, Bloomingdales, and Amazon, but it will let its current licensing agreements expire. Trump has not been involved with the brand since stepping into her White House role in January 2017 (although 2017 ethics disclosures revealed she took home at least $6 million from it). Previously, she was the executive vice president of acquisitions and development in the Trump Organization. The company’s 18 employees have all been informed, according to the Wall Street Journal; Page Six adds that the staff will be laid off rather than transferred to a different part of the Trump Organization. Ivanka Trump the brand was known for its ready-to-wear women’s clothing, handbags, fashion jewelry, and shoes, mostly in the $100-to-$500 range. In December 2017, it opened a store in Trump Tower in New York City; a call to the store Tuesday went unanswered, and Business Insider reported that it has already shut down. The brand was also plagued by controversy, including ethics questions regarding its relationship to the White House and labor violations among its numerous subcontractors. Right around the time Donald Trump won the presidency, the label became been the target of a major boycott, and participants are now celebrating the shuttering of the brand as proof that anti-Trump resistance works. Trump’s foray into fashion started in 2007 with her fine jewelry line (which was dropped by Neiman Marcus in February 2017 before it was permanently shut down in March 2017). The current Ivanka Trump label started in 2010 with shoes. It quickly took off in the retail world, with stores like Nordstrom lining up to carry the label. The fashion brand expanded into handbags in 2011, and in 2013 it signed an agreement with the licensing company G-III to launch clothes. By 2015, the Ivanka Trump label was a staple at department stores. 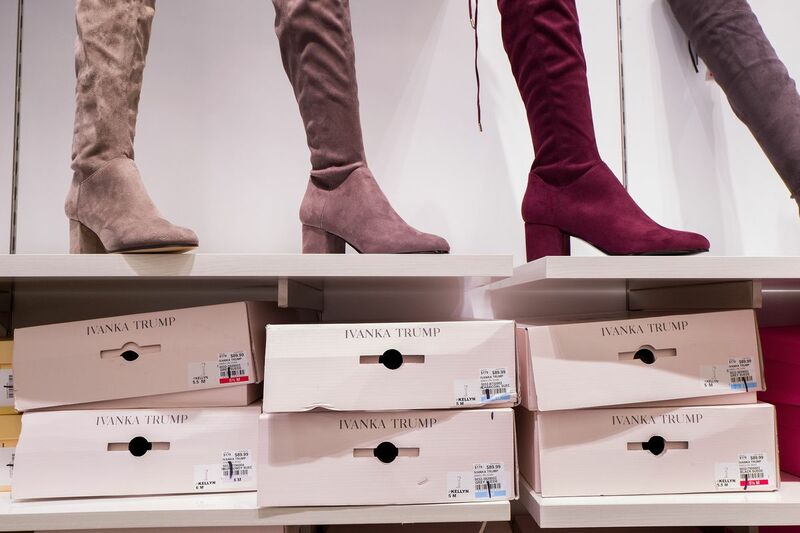 Ivanka Trump brand boots for sale at the Century 21 department store February 10, 2017, in New York City. At one point, according to WWD, the label was worth $100 million. Part of the company’s DNA was a lifestyle campaign promoting working women, Women Who Work, which spotlighted working moms and was a “celebration of the multifaceted nature of the working woman,” as Trump described it to Racked in 2015. Once her father took to the campaign trail in 2016, though, the situation got more complicated for Ivanka the person, and by extension, Ivanka the brand. Trump campaigned for her father, gaining mass appeal from young white female voters (dubbed the Ivanka voters). From the very early days of the campaign, there were murmurings of conflict of interest. At the Republican National Convention in July 2016, Ivanka Trump wore a dress, jewelry, and shoes from her brand to introduce her father — then still a candidate — as a speaker. A photo of Trump standing in the outfit in front of a crowd was tweeted out by her company, recommending that followers “Shop Ivanka’s look from her #RNC speech.” The tweet linked to Trump’s dress on sale at Macy’s for $138. It sold out the next day. Because Ivanka’s fashion line was a visible target for both Trump supporters and opponents, it was the subject of boycotts. A call to stop shopping at stores that carried the line, along with all Trump family products, first came in October 2016, when the infamous Access Hollywood tape was unearthed. Efforts organized by marketing professional Shannon Coulter turned into a national campaign dubbed #GrabYourWallet, where retailers carrying Trump products were added to a list and shoppers were encouraged to boycott them until they stopped carrying the line. Major stores including Nordstrom, Neiman Marcus, and, most recently, Canada’s Hudson’s Bay dropped the line, although all claimed the decision was based on sales and had nothing to do with politics. Right around the time the label was making headlines for being dropped by stores, employees at T.J. Maxx and Marshall’s told the New York Times that they were instructed to dump Ivanka Trump signage in the garbage and mix the collection with the rest of the clothes, instead of featuring it prominently. In December 2017, seemingly because of the trouble the brand was having getting placed in other stores, the Ivanka Trump line opened a store inside New York City’s Trump Tower, on Fifth Avenue. The company also started selling through its website in September 2017. Although Abigail Klem, the brand’s president, told Refinery29 that 2017 was bringing the label “some of the best performing weeks in the history of the brand,” the Wall Street Journal found that sales of the Ivanka Trump label fell 45 percent over the last 12 months at Macy’s, Bloomingdales, Zappos, and Amazon, according to the receipt-gathering firm Rakuten Intelligence. Perhaps that’s why the White House felt the need to publicly promote the brand so much, sometimes at the expense of political ethics. Almost as soon as Donald Trump took office, the White House’s more-than-friendly association with Trump Organization brands was pulled into debate. On February 8, 2017, in response to the news that Nordstrom would drop Ivanka’s label (despite the fact that it said the decision was strictly due to poor performance), the president tweeted his anger at the department store. At the time, White House press secretary Sean Spicer claimed that the outburst was due to Trump’s desire to stand up for his daughter, but to many others, it was a clear abuse of power. This, however, may have violated a federal ethics law that states that “an employee shall not use his public office for his own private gain, for the endorsement of any product, service or enterprise, or for the private gain of friends, relatives.” Conway later received “counseling” on the subject and apologized to President Trump. Conflicts of interest weren’t the only publicity problem the Ivanka Trump label faced. Like her father’s necktie collection, the Ivanka Trump label had licensing deals with subcontractors in Chinese factories, and in 2016, workers at the Xuankai Footwear factory said they were required to work shifts up to 16 hours, were paid illegally low overtime rates, and systematically dealt with delayed payments. One worker quit after just a few hours at the factory out of fear. In 2017, the line came under fire when three activists investigating Huajian Group, the Chinese factory where Ivanka Trump shoes were made, were detained by the Chinese government. China Labor Watch, the group the activists worked for, wrote a letter to Trump pleading for her help. Klem, the company president, issued a statement to Racked saying that the label hadn’t worked with the factory in question in more than three months because it only worked with factories that are “required to operate within strict social compliance regulations.” Klem, however, did not mention the jailed activists, who were freed in June. A freight logistics firm that the brand used to facilitate shipments of Ivanka Trump merchandise from China was the target of a discrimination lawsuit in 2015. Marilyn Cohen, a 67-year-old Orthodox Jewish woman, filed a civil rights lawsuit against Alba Wheels Up International claiming she was shunned for her religion and her age. She also says that when she complained about a truck driver who often visited the office wearing a T-shirt with a crude sexual slogan, she was humiliated in front of the other employees. The lawsuit was later dismissed and sent to private mediation. And there were controversies within the company itself. In 2016, Marissa Velez Kraxberger, who had served as the brand’s creative director for two years, came forward on Facebook to call out Ivanka Trump’s hypocrisy for advocating for paid maternity leave when her own company didn’t offer any. For her part, Trump said the decision to close her brand did not have to do with its performance, but was instead based on her desire to remain in Washington, DC, indefinitely. This could be further indication that the family has decided to make politics, not business, its long game. Although the company would not acknowledge any connection between its closure and #GrabYourWallet, the brand was certainly beleaguered, whether because of all of the negative press or the fact that it was constantly under scrutiny. Supporters are interpreting the news as a sign that such collective action can work on a broad scale, and could signal change on a political level as well. This is people power at work. This is you using your voices and your hard earned money to push back on extremism. This is you saying no to the hate that the Trump administration embodies. You are #GrabYourWallet and this is your win. So even if the Ivanka Trump brand name does live on in some other form, there are a whole lot of people watching. Previous articleTrump’s easing penalties on a Chinese company that sold to North Korea and Iran. Republicans are letting him do it.